Welcome to another Friday Feast, this week featuring a must-read author, a delicious dessert and an utterly juicy giveaway! But first, news from Us Heins Weren’t Meant To Play Golf Weekly. I snuck out for a practice round last Tuesday and played 9 under my handicap. Marvellous, yes? Well, it would have been if I hadn’t then gone out in competition and shot 5 over. Sigh. The great golf god giveth and the great golf god taketh away, the sod. Now onto more uplifting things, namely my fantabulous guest Christina Brooke! If you love historical romance then Christina should be on your must-read list. She’s brilliant! Great dialogue, gorgeous settings and truly memorable heroes and heroines. This is feel-good romance at its best, which is why her books have won and been nominated for so many awards. Beckenham’s brief engagement to Georgie taught him one thing – when it comes to a wife, he wants a woman who will do her duty and cause no trouble. When the fiery Georgie falls unexpectedly into his arms, Beckenham remembers just how lushly delectable she is. Suddenly, the idea of actually marrying Georgie is irresistible. Convincing her will take more than a simple proposal, however. In a battle of wills, can passion conquer pride? The Greatest Lover Ever is available for pre-order right now. Try Booktopia, Bookworld, QBD The Bookshop, Angus & Robertson, Amazon (for Kindle), iTunes, Barnes and Noble, Google Play, or your favourite bookstore or ebook retailer. Can’t wait to read a Christina Brooke? Then when not try her current release, London’s Last True Scoundrel, or the first in her famous Ministry of Marriage series, Heiresss in Love. I promise you won’t be disappointed. Now you’re loaded up, here’s Christina! From Greatest Lover To Greatest Christmas! Hello everyone and thank you so much to Cathryn for having me here today. I LOVE food—eating it, talking about it, exchanging recipes—so the Friday Feast is perfect for me! I do love cooking—baking, in particular—but I have to say that running a family and a writing career doesn’t leave me a lot of time or patience to do very fiddly dishes. So nothing pleases me more than when I find a dish that looks complicated but actually is very easy to put together. That’s definitely true of the Christmas Ice Cream Cake I have to share with you today. I made this last year for Christmas Day and it was a huge hit. Christmas Day in Australia is almost always ridiculously hot and while plum pudding might be traditional fare, it’s not much fun to eat in the middle of the day in the middle of summer. Particularly if you’re like half of my family and loathe dried fruit! Donna Hay is always a wonder when it comes to easy delicious cooking and this recipe is from her December 2012 “Celebrate” Magazine. She calls it a Honeycomb and Caramel Trifle Log. So here’s how you make it. This is so simple! It does take time, because the layers have to be frozen separately, one at a time. But the beauty is that you can prepare this dessert well in advance of the day itself so you don’t have to be baking or stirring in a hot kitchen on Christmas Day. And it keeps for a long time, too. *Grease and line a 2 litre capacity rectangular loaf tin with baking paper. *Crumble 120g of store bought sponge cake into a bowl, douse with 2 tablespoons of sweet sherry and leave a few moments to soak in. *Mix 200g of store bought vanilla ice cream with the sherry-soaked cake crumbs. Pour ice cream mixture into loaf tin and smooth out so it’s level. *Place 8 plain chocolate biscuits over the layer of ice cream, overlapping them slightly. You might have to improvise a little, depending on the type of biscuit available but any kind of arrangement will get the job done. *Mix 160g or ½ cup of store-bought caramel or dulce de leche with 200g of vanilla ice cream. *Pour caramel ice cream mixture on top of the frozen sherry cake and biscuit layer, finishing with another layer of 8 chocolate biscuits. *Final layer is 100g smashed honeycomb shards mixed with 300g vanilla ice cream. Pour over the first two layers and freeze for 2 hours. If you can’t find plain honeycomb and can’t be bothered to make it, a smashed up Violet Crumble bar is fine. I made a kids’ version of this cake as well, with chocolate, caramel and vanilla layers and topped it with M&Ms. They loved it! There’s really no limit to the variations you can make with this cake. You can just choose your three favourite store-bought ice cream flavors and use those. This photo is of the version I made last week. Unfortunately, I came down with chicken pox in between the second and third layers so this one only has two layers! 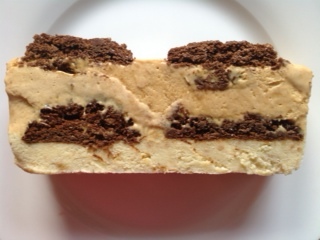 But you get the idea of how great the cross-section will look when it’s finished. A very merry Christmas to you all and I hope you have a wonderful and stress-free holiday! What about you? What’s your favourite hot weather dessert? Do you like to eat traditional plum pud on Christmas Day or do you have another tradition you’d like to share? I am groaning with need here, Christina, and not only for The Greatest Lover Ever! That dessert looks absolutely divine. What a brilliant alternative to the traditional Christmas pud. I’m definitely putting this recipe on my Chrissy list. Delish! Now, my Santa-hatted Feasters, would you like to win yourself a signed advance copy of The Greatest Lover Ever? Of course you would! Then get your thinking caps on and tell us what your favourite Christmas or hot weather dessert is. I’m a bit of a sucker for good old fruity pud, but I’m also a big fan of my White Chocolate Decadence. And really, you can’t beat an old-fashioned icy-pole on a hot day either. Not exactly fancy, but it certainly does the job! So share away and we’ll put you in the draw. But be quick about it. Closes midnight Tuesday AEST, 10th December 2013. Australian postal addresses only. If you’d like to learn more about Christina and her truly wonderful books, please visit her website. You can also connect via Facebook and Twitter. This giveaway has now closed. Congratulations to Paula who has won an advance copy of The Greatest Lover Ever. Thanks to everyone who took part. Hope you had as much fun as we did! This entry was posted in Friday Feast and tagged Angus & Robertson, Australian Authors, Australian fiction, Australian romance authors, Australian Writers, book giveaway, Booktopia, Bookworld, Cathryn Hein, Christina Brooke, Cooking, ebooks, Food, Friday Feast, giveaways, Google Play, Heiress In Love, Heiress in Love by Christina Brooke, Historical Romance, iTunes, Kindle, London's Last True Scoundrel, London's Last True Scoundrel by Christina Brooke, promo, QBD The Bookshop, Recipes, The Greatest Lover Ever, The Greatest Lover Ever by Christina Brooke on December 6, 2013 by cathrynhein. Welcome to Friday Feast! I’m very excited about today’s guest. Not only is she a fabulous writer and gorgeous person, she’s taking us on an armchair trip to my favourite country, Italy! Enough of that. Time to say ciao bella to one of Australia’s favourite rural romance authors, Fiona Palmer! Fiona is a born and bred country girl who shot to ru-ro (as we fondly call it) stardom with The Family Farm, following that huge success up with Heart of Gold, The Road Home and The Sunburnt Country. All best-sellers and complete heart-warmers. Now Fiona has another story for your rural library, and this is being touted as her best yet. Take a look at The Outback Heart. Indianna Wilson is a country girl through and through. She’ll do anything she can to save her beloved home town from disappearing off the map – even if she has to die trying. She brings Troy Mitchell to her tiny outback town, with hopes that he can bring a breath of fresh air to the Saints football club and lift the wider farming community. He’s just the spark they need in Hyden but it’s the fire that he ignites in Indi’s heart that takes her by surprise. She knows he’s feeling something too – why, then, does he insist on pushing her away? What is it from his dark past that’s preventing them from sharing a future? As the town rallies together and their fighting spirit returns, Indi and Troy discover that sometimes life offers up a second chance – you just have to be brave enough to take it. The most heartfelt and moving novel yet from favourite Australian rural romance writer and bestselling author of The Family Farm. Footy, love and the outback, how can you resist? Hie thee down to your nearest bookstore or get that mouse a-clicking. Signed copies of all Fiona’s books are available now from her website, and between now and Christmas Fiona will throw in a stubbie holder with every purchase. Otherwise, for the paperback, try Booktopia, Bookworld, Dymocks, QBD The Bookshop, Angus & Robertson, direct from Penguin Australia, your local independent bookshop or nearest chainstore. For the ebook visit Kobo, Amazon (for Kindle), iTunes, Google Play, BigW ebooks or JB Hi-Fi. Now enjoy your Italian holiday. Thanks to my mate Cathryn for having me, I love her Friday Feasts. Today I thought I’d talk about Pizza. 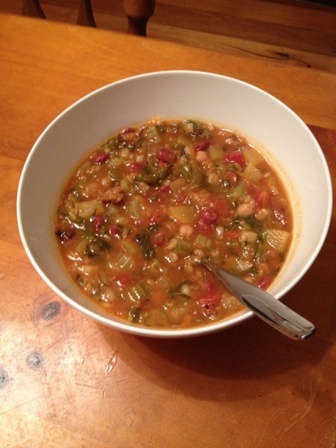 (An all time favourite of mine because its easy and my kids eat it!!) This is funny because I hadn’t eaten a Pizza Hut pizza until I was 18. We ate plenty of frozen McCain’s pizzas growing up but I’d never had a fresh made one. I was living in Perth and had part time work (while at College) at the Peppy Grove Pizza Hut and that was the first time I’d ever eaten one, especially hot out of the oven. Then I couldn’t understand why I’d never eaten one sooner. But as I was looking back through my photo’s for a ‘Pizza’ pic I was quite shocked to see how many photo’s I had of me eating pizza! Crikey, it makes it look like that’s all I ate! 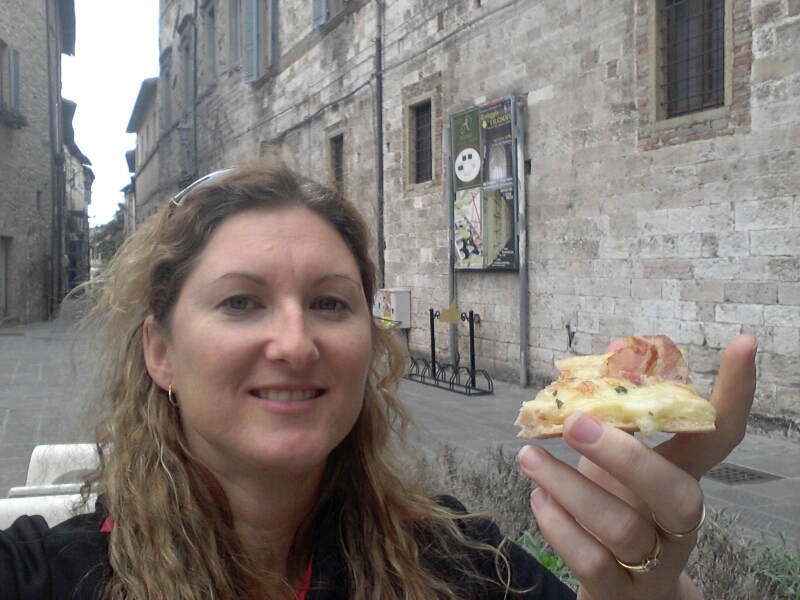 One thing I realised is that the pasta and pizza’s are really simple in Italy. They are not full of other ingredients. 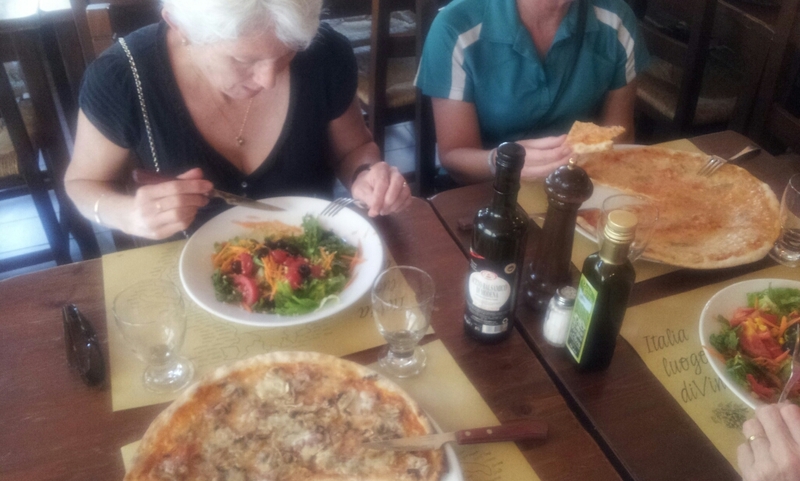 We make pizza’s or pasta at home and have heaps of vegies and herbs in them, in Italy its simple. In Pompeii we had a pasta dish which just looked like pasta with a tin of crushed tomatoes in it and a basil leaf on top. 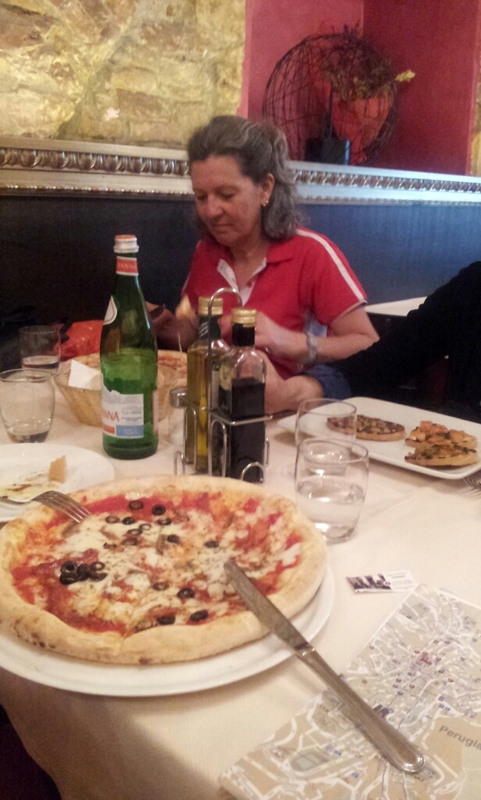 When we were in Rome, we found a fantastic ristorante/pizzeria right behind our hotel. Sadly we wished we had found it two days earlier!! But we went there so often that we felt like locals and the managers were so lovely. Even their little girl was gorgeous. They had a big pizza oven and the size of our pizza’s were huge. But the nice thin base made it possible to eat the whole lot! One night we had something different (see I didn’t always eat pizza) and they brought us one of the pizza bases which had been coated in oil, sea salt and sprinkled with rosemary. OMG it was delicious and perfect with our meal. They also served their own fresh cooked potato chips while we waited. Brancaleone the place was called. Loved it. I won’t mention the yummo choc cake we had too. Sigh. My jealousy of you right now, dear Fiona, is ENORMOUS! Italy is such a wonderful place. 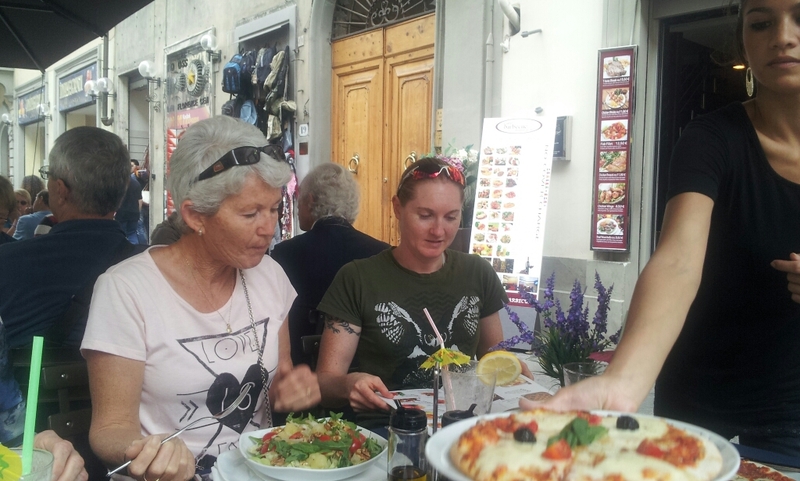 Gorgeous people, beautiful scenery and language, all that history and art, and the food! Simple and delicious. Now, Feasters, we have a giveaway, Simply share your favourite pizza topping in the comments and you’ll go into the draw to win a signed paperback copy of The Outback Heart. Easy! So… are you a traditionalist, and prefer a good old Margherita? Or maybe you’re a modernist and enjoy exotica like tandoori chicken or roast pumpkin, fetta and chorizo? I’ll admit to the youthful indiscretion of loving pineapple on my pizza but now I’m a Margherita girl through and through, although I did once have a wonderful pizza made with tiny slivers of potato, garlic and herbs that I’d be happy to scoff again. So what’s your preferred topping? Reveal and you could win! Entries close midnight Tuesday, AEST, 19th November 2013. Australian postal addresses only please. If you’d like to learn more about Fiona and her books, please visit her website. You can also connect via Facebook and Twitter. This giveaway has now closed. Congratulations to Melissa who has won a signed copy of The Outback Heart. Thanks to all who took part. I hope you’ll join in the fun again. This entry was posted in Friday Feast and tagged Angus & Robertson, Australian romance authors, Australian Writers, BigW ebooks, book giveaway, Booktopia, Brancaleone, Brancaleone Birreria e Osteria, Cathryn Hein, Dymocks, ebooks, Fiona Palmer, Food, Friday Feast, giveaways, Google Play, Italian food, iTunes, JB Hi-Fi, Kindle, Kobo, Penguin Australia, pizza, Pizza in Italy, promo, QBD The Bookshop, rural romance, The Outback Heart, The Outback Heart by Fiona Palmer on November 15, 2013 by cathrynhein. The Romance Writers of Australia conference is over for another year, and what a brilliant time was had by all. There is nothing quite so inspiring and warming as hanging with your tribe, and Fremantle was a fantastic location, well worth the trip to the west. I’ll be blogging about our fun and games later, so keep your eye out for that. But first, to the task at hand and another Australian debut author. Leisl Leighton is a tall redhead with a big imagination, a double major in English Literature and Drama, a former career as an actor, singer and dancer, as well as script writer, stage manager, and musical director for cabaret and theatre restaurants. She also has a hubby, two boys and a dog named Buffy, and now she’s a published author of romantic suspense. Yup, this is one full-on life liver! How cool does that sound? I got all shivery just reading that blurb. Killing Me Softly can be yours now with just a few clickety-clicks. You can buy the ebook direct from the publisher Destiny Romance or try Kobo, iTunes, JB Hi-Fi Books, Google Play, Amazon Kindle or Angus and Robertson. Please welcome Leisl to Friday Feast! When I was growing up, whenever winter rocked around, it meant two things in my house – hoping it would snow up at the mountains in time for our annual ski trip to Mt Buller and lots and lots of soup for lunch and dinner. My whole family loved our ski trip and we loved warming soup. And when the two were combined – sublime! For me, these two things are still something I look forward to every year. My mum loves soup. She did then and she still does, and that has kind of rubbed off on me. She used to regularly make a huge pot of some kind of soup, some of which we would have for dinner and lunches over the next few days and some of which was put into the freezer for those nights she didn’t feel like cooking anything (something I can hugely relate to now I’m a working mum). Pea and ham, tomato, cauliflower and ham, broccoli, pumpkin with sweet potato and a hint of curry, potato and leak and the perennial favourite – minestrone. There were others she tried that weren’t so successful, but these were the ones we ate most often. I can still close my eyes and remember the smell of the hamhock cooking in the pot with the split peas, the rich, salty aroma that would pervade the house and make my stomach rumble and the satisfaction of finishing my bowl with a hunk of bread and butter to scoop up the dregs. My little family (husband, two sons) favourites are a bit different -: vegetable wonton soup, pumpkin, sweet potato and curry soup, chicken soup (my husband makes this with matzo balls just like his grandma used to make), a version of my mother’s minestrone and a fabulous soup I found a recipe to in a great Mediterranean cookbook I have, spinach and rice soup. 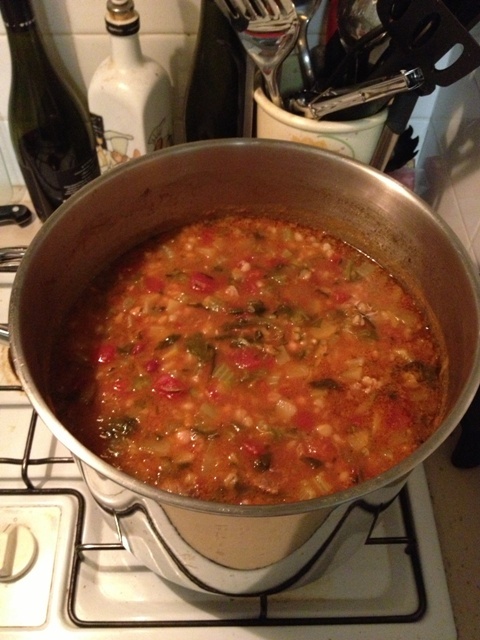 While I love all of the above, the one that warms the cockles of my heart and fills my belly with yummy, warming goodness is my minestrone soup. Like much of my cooking, it’s based on what my mum used to do, but seeing I’m not a follow a recipe kind of girl (I like throwing things I feel like eating in a pot and adding stuff to taste), it has changed to something far more chunky. I have also used onion, eggplant, cauliflower, broccoli, cabbage, sweet potato, capsicum, mushrooms – pretty much any veg I’ve had in the fridge that I need to use and would go in a soup together well. You can also use any Italian herbs you like and add garlic too. I add garam masala spice instead (because, as I said, garlic doesn’t like me). I like different textures in the soup, which is why I grate some of the veg and chop or dice the rest. Sauté the vegetables in some oil and the herbs and spices in the large pot, add the beef, let it cook through a little, throw in the tinned tomatoes, chick peas and kidney beans and stir, then add the vegetable stock and bring to boil. When it’s boiling, add the pearl barley and stir then drop to a simmer. The longer you can leave it on to simmer and cook, the better – 3-4 hours is good, occasionally stirring. My husband likes it thick, almost like a stew, but if you want it to be more soup-like, you could add more water or stock. You can even add some wine (red wine is best). It’s best served with some parmesan and a hunk of fresh bread. I hope you enjoy it as much as I enjoyed sharing my love of soup with you on the Friday Feast. Thanks so much for having me here. My pleasure to host you, Leisl, and thanks for that wonderfully soupy post! 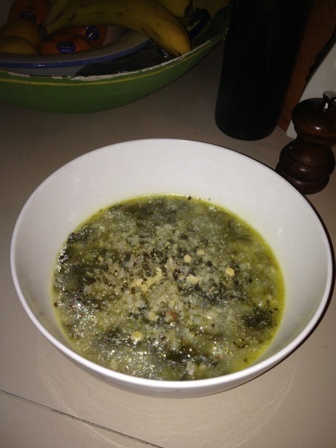 Soupadouping it up is one of things that makes winter tolerable (that and open fires, AFL footy, Guinness and red wine). Such a lovely comforting feeling to sit down with a steaming bowl of soup when it’s filthy outside. Now sit up, my fine Feasters. Most generous person that she is, Leisl has offered give away to one lucky commenter a Kindle ebook copy of Killing Me Softly. Simply reveal which soup warms the cockles of your heart and you’ll go into the draw. 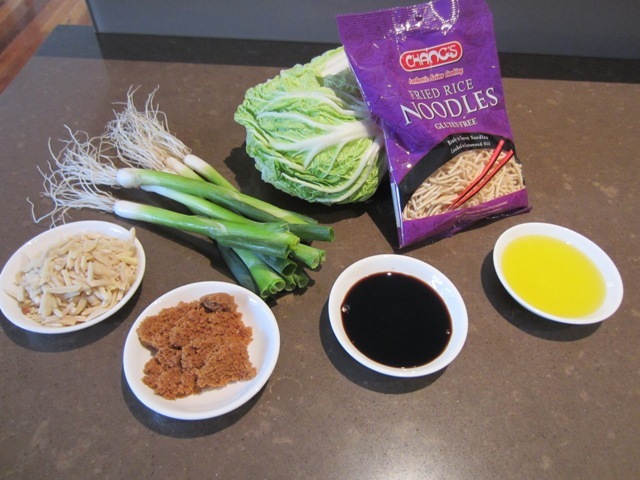 Are you a hearty vegetable sort or maybe a traditional style chicken noodle? Perhaps you’re a hot n spicy type and crave a big bowl of blow-your-nostrils-out tom yum soup? Come along. Reveal all. We’re nosy buggers on the Feast and you could win! Giveaway closes midnight Tuesday AEST, 27th August 2013. Ebook giveaway prize available in Kindle format only. Open internationally. Rah! If you’d like to learn more about Leisl and her books please visit her website. You can also connect via Facebook, Twitter and Goodreads. You can also watch this video of Leisl being interviewed by Carol George of Destiny Romance, where she talks about Killing Me Softly and how she came to write it. This giveaway has now closed. Congratulations to Paula who has won a Kindle ebook copy of Killing Me Softly. Thanks to everyone who took part. Hope to see you again soon! This entry was posted in Friday Feast and tagged Angus & Robertson, Australian romance authors, Australian Romantic Suspense, Australian Writers, book giveaway, Cathryn Hein, Cooking, Destiny Romance, ebooks, Food, Friday Feast, giveaways, Goodreads, Google Play, iTunes, JB Hi-Fi, Killing Me Softly, Kindle, Kobo, Leisl Leighton, Minestrone soup, promo, Recipes, Romance Writers of Australia, Romantic Suspense, Soup recipes, Winter food on August 23, 2013 by cathrynhein.